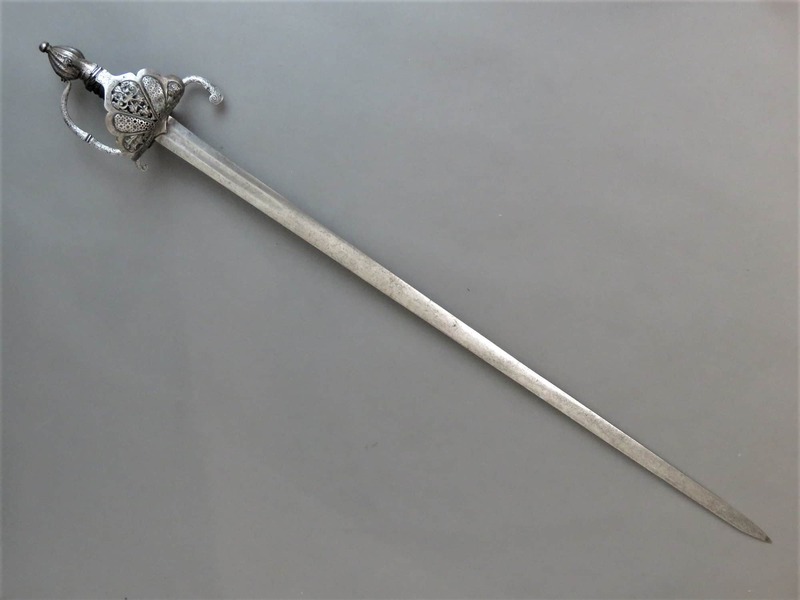 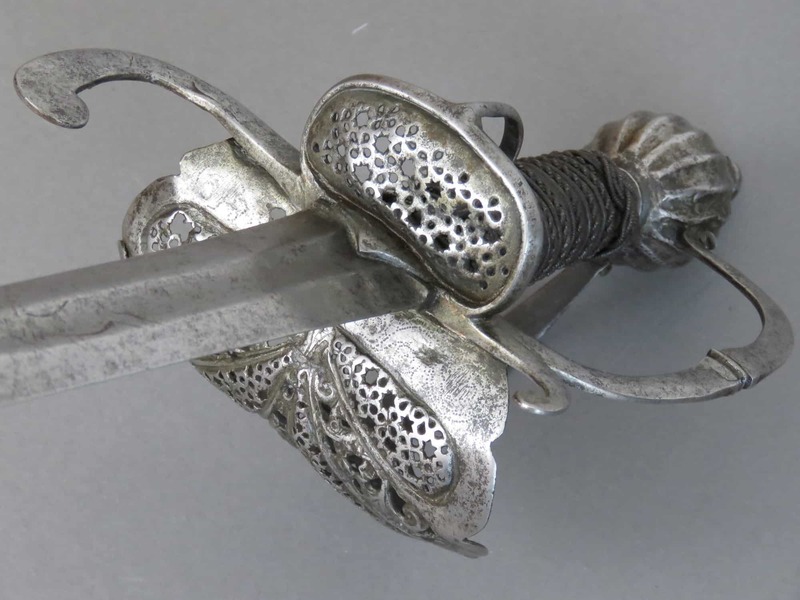 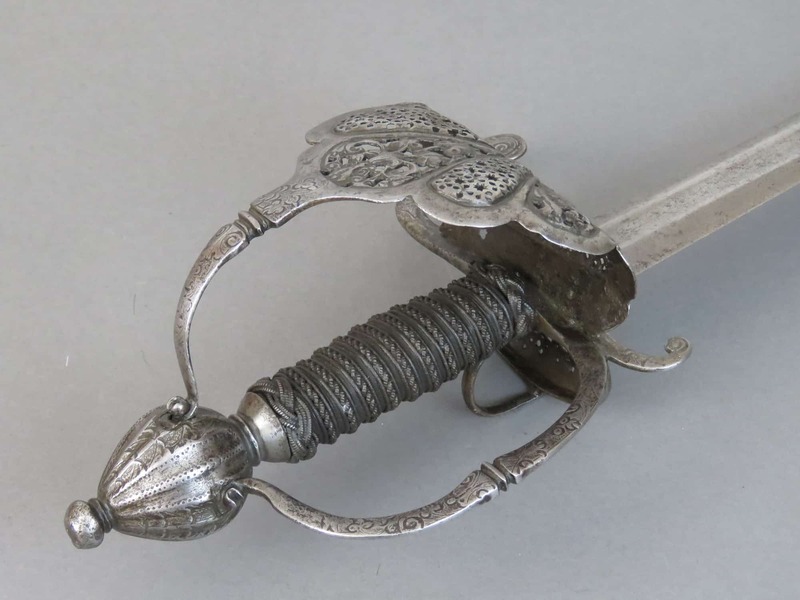 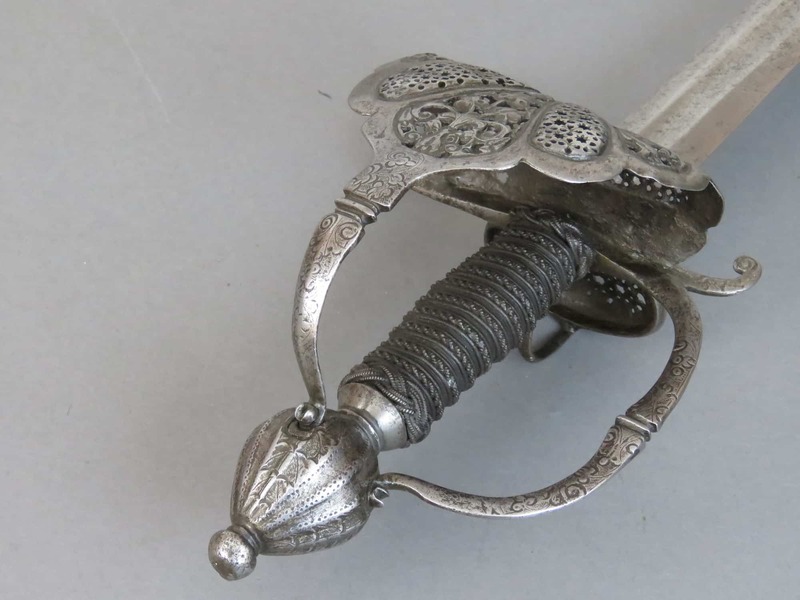 An attractive North European Riding Sword dating to the early 17th century, mounted with an intricately chiselled and engraved hilt, in fine and original condition. 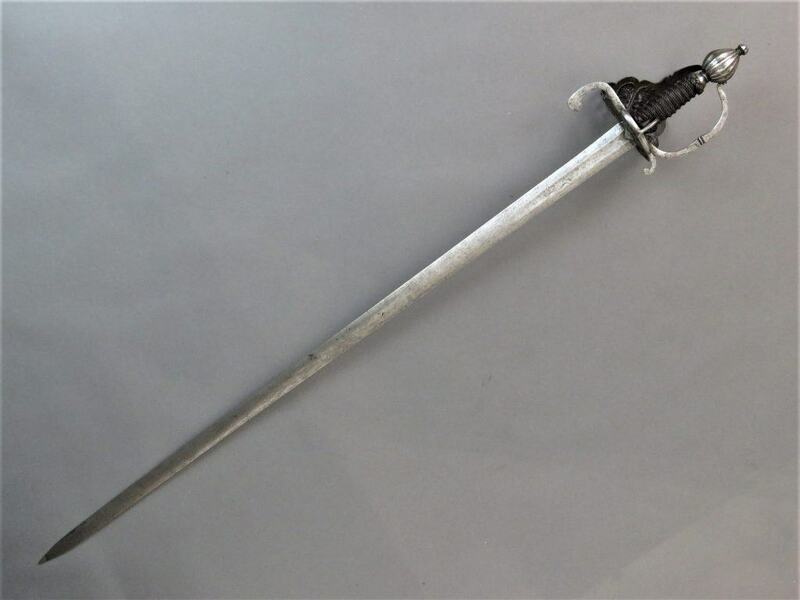 The long blade retains its full “riding” length and the sword is well balanced in hand. 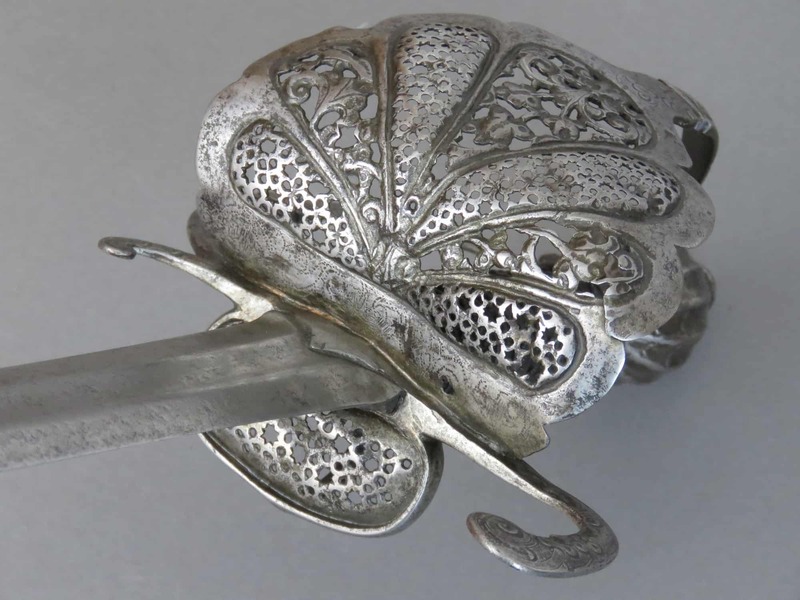 Made for right hand use, the prominent feature of the hilt is the clam guard formed into seven segments which increase in size as they fan outwards from the quillon block, then upwards towards the pommel, the largest in the middle. 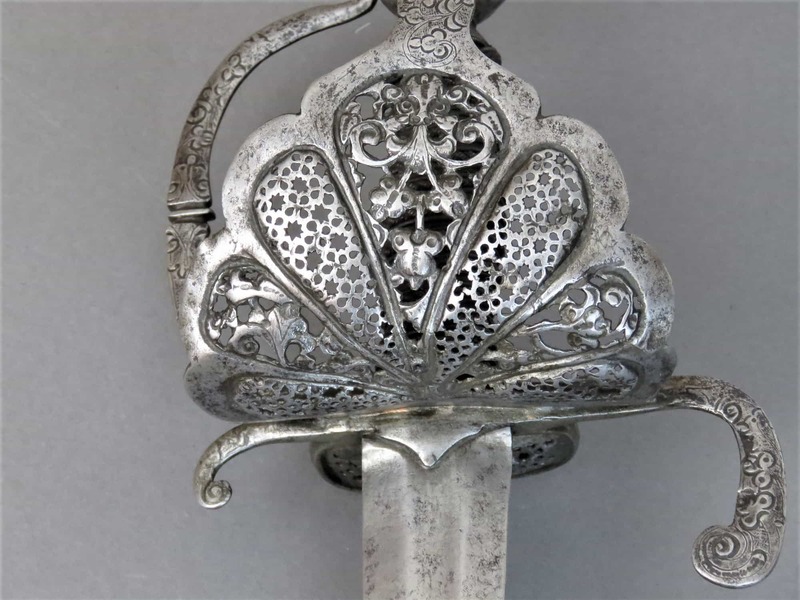 Each segment is protected at the edge by a thick scalloped rim of iron. 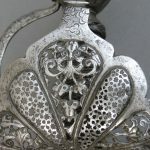 The segments in turn are pierced alternately with designs of stars and circles, or foliage, with the middle segment containing foliage and a grotesque face, possibly a representation of a “green man” towards the top. 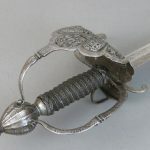 From the top edge of the middle segment a side guard bar of flattened section extends upwards to screw into the pommel. On the inside of the hilt a smaller oval ring is forged onto the block, infilled with a plate pierced with circles and stars similar to some of the segments in the main shell guard panel, plus a thumb ring. 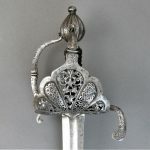 From the front of the block a flat section knuckle bow extends upwards in a “D” shape, the end of which is screwed into the pommel in similar manner to the side guard bar. 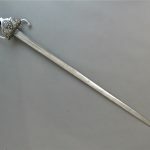 Beneath this a long flattened primary quillon curls downwards at the front to terminate in a swelling, and is complemented by a smaller quillon of similar form to the rear. 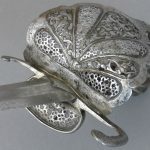 Both guard bars and quillons on the outside are engraved with floral designs similar to the main guard shell face of the hilt, and underneath. 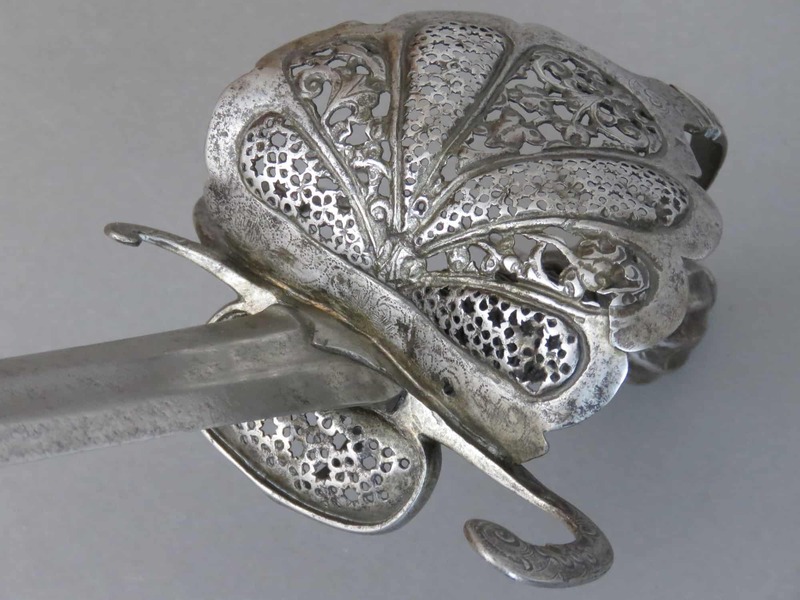 The oval pommel is mounted with an integral pommel button on top decorated with horizontal rings, and a flared neck beneath, also decorated with rings at its narrowest point. 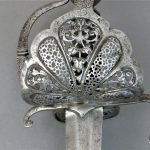 The pommel is fluted with grooves and rounded ridges, and similar to the hilt is further engraved with foliage on the outer side. 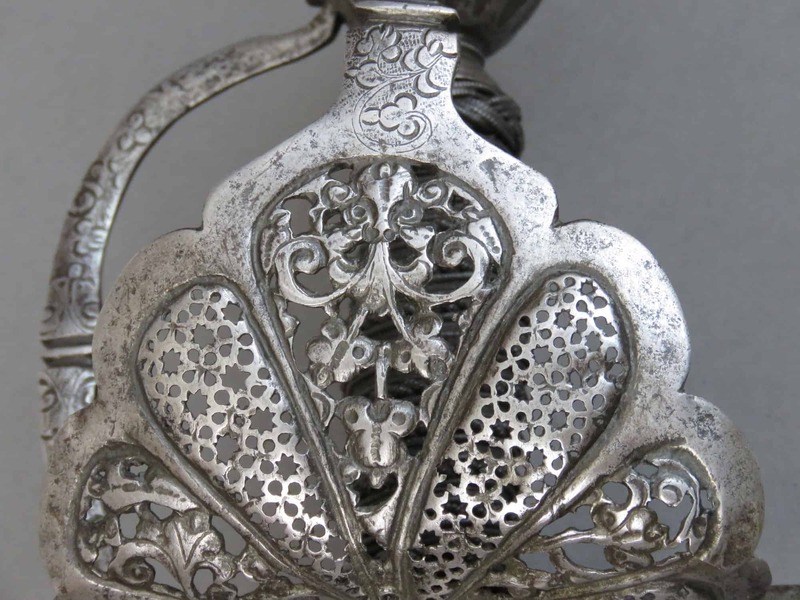 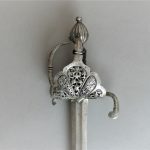 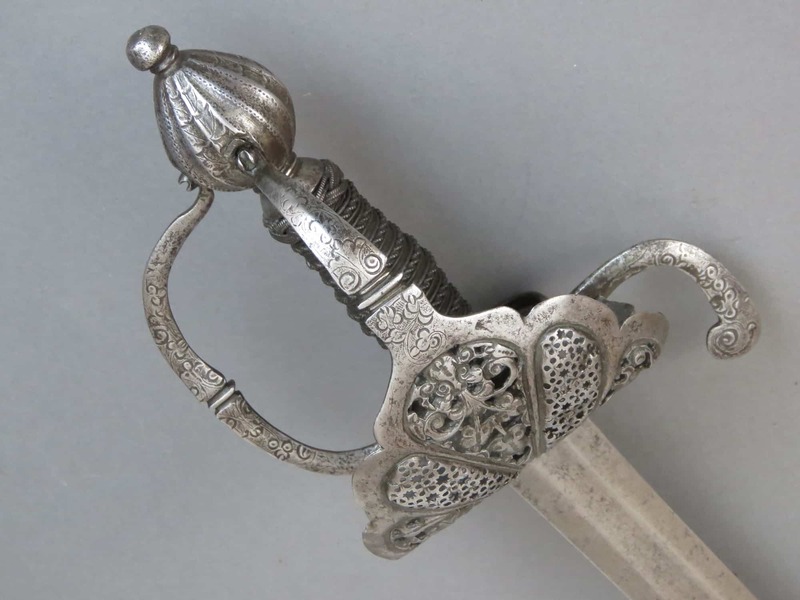 Clearly the intricate decoration on the hilt is applied to the outside where it is most likely to be noticed when the sword is either in-hand or in its scabbard. 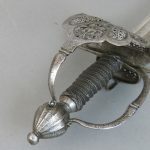 The attractive and intricate cylindrical grip is of wood, diagonally bound with twisted copper rope-work, interspersed with copper ribbon, and “Turks Heads” top and bottom. 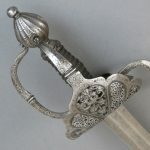 The double-edged blade has a short ricasso secured at the hilt by triangular langets either side. 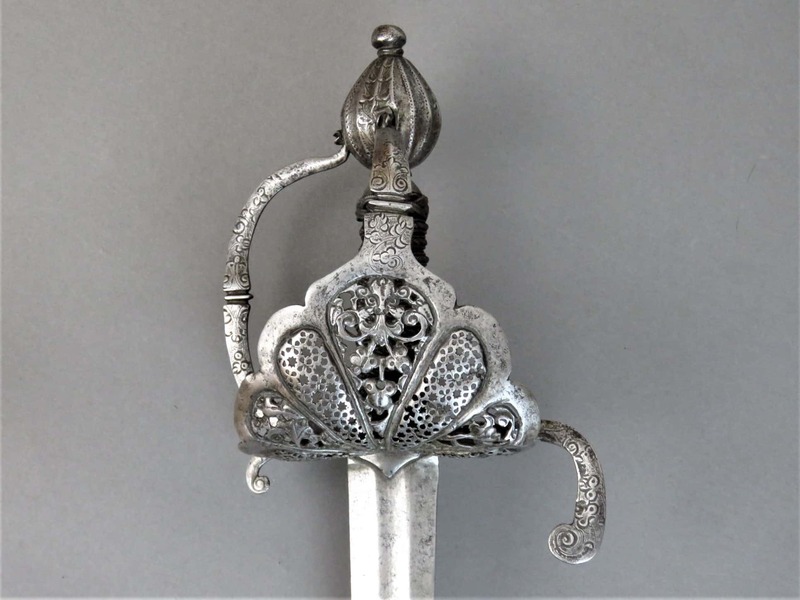 A shallow broad fuller extends for approximately a quarter of the blade length. 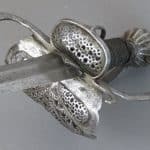 On one side inside the fuller a stylised running wolf armourers mark is incised in lines filled with latten. 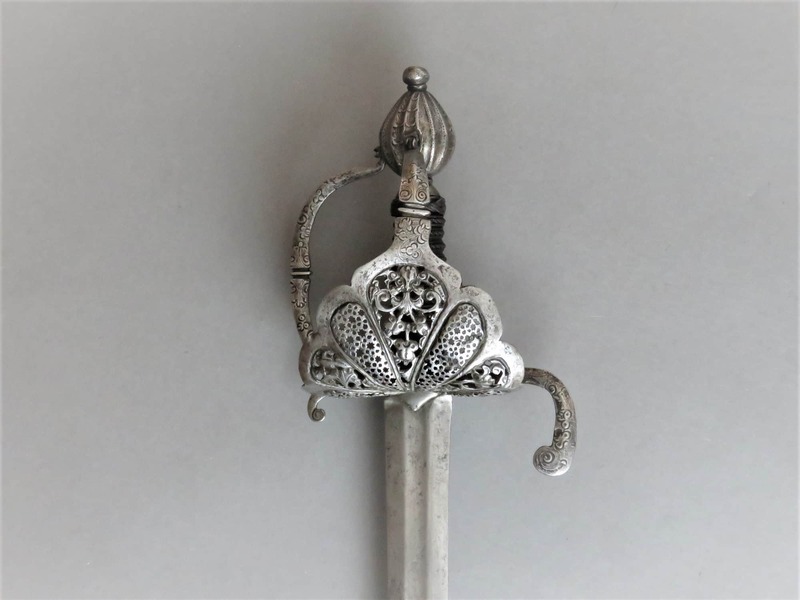 The blade gently tapers to its point. 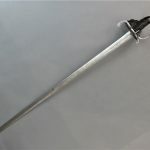 The blade length is 38.75 inches (98.5 cm) and overall the sword is 45 inches (114.25 cm) long.